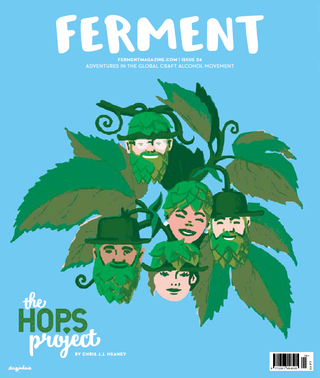 Chris J.J. Heaney has been a familiar face on London’s legendary Bermondsey Beer Mile from the earliest days of the British craft beer revolution, as part of the group of brewers, artists and friends who would go on to found breweries including The Kernel, Brew by Numbers and Partizan, where Chris honed his craft as a brewer. Chris originally hails from Donegal in the north of Ireland, andsays he felt an affinity with beer from a young age, watching his grandfather enjoy the gaelic football on television with his customary glass of Guinness and bowl of dry-roasted peanuts. “I remember as a child being fascinated by the textures and the colours in the glass, the juxtaposition of black on white, and thinking ‘that looks like something I’d really like to consume’. Fortunately I had liberal parents, who allowed me to taste beer quite early, which meant I never had that experience of illicit beer and sneaking around. That gave me a balanced approach to alcohol I think.” Chris has always been fascinated by the role alcohol plays in bringing people together and has a deep love of pub culture. But it wasn’t until he left Ireland to study classics at Oxford that he really fell in love with beer, and specifically cask ale. After leaving university, he moved back to Dublin to train as an actor, sharing a house with his brother who was studying at the city’s Trinity college. They became regulars at The Porterhouse – which at the time was seen as pretty radical in Ireland’s staid beer scene – and fed their shared passion for good beers from all around the world. Eventually though, just drinking the beers was not enough and they resolved to try their hand at brewing. “I still remember our semi ill-fated first attempt,” recalls Chris. “We didn’t have a whole lot of idea about what we were doing, so we just wandered down toward the back door of this industrial bakery near our house, to ask if we could have some yeast. The guy asked what we wanted it for, so we told him we wanted to make some beer. He was absolutely perplexed, and rolled down the shutter without saying anything. The two of us turned around to walk away, thinking that was his response, but then the shutter rolled back up and he came out with this log of dried industrial bread yeast. ‘There you go lads, do what you want’. Now working as an actor, Chris moved to London in 2010, and took the opportunity to immerse himself in the capital’s nascent craft beer scene, hanging out with the likes of The Kernel’s Evin O’Riordan and Partizan’s Andy Smith, who at the time was working at Redemption Brewing in Tottenham. When Andy first floated the idea of starting a brewery of his own, Chris casually offered to lend a hand if he ever needed one. He started out “basically washing bottles” but quickly sharpened the skills he’d picked up brewing at home, completed his professional training and proved himself a gifted and highly creative brewer. 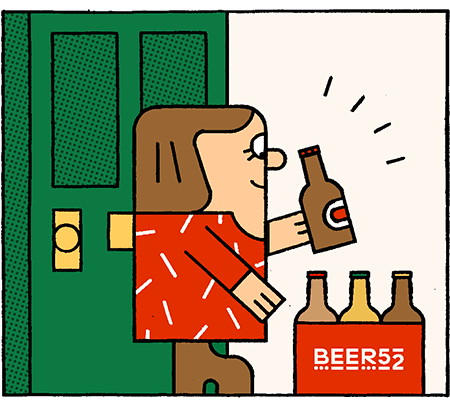 Now joining Beer52 as our first head of beer, Chris will have a key role in what goes into the box, scouring the world in search of the best and most innovative beers to bring to our 30,000 members. He’ll also bring his creativity and brewing expertise to creating our own beers, for future experiments like The Elements Project and The Hop Project, as well as collaborating with our favourite brewers on exciting and exclusive new beers.